Event marketing is a true art. There are so many different aspects you have to keep in play, it can be like spinning plates. But if you think strategically about your event marketing process you can get some truly spectacular results. One of the best ways to promote your event is by reaching out to your existing network. They are the most committed to your brand, and constitute ‘qualified leads’; this means they are already highly primed to attend your event due to having a pre-existing interest. Think of your network as the core of your event; they’re the people most guaranteed to attend. Once you have got buy-in from your main network, you’ll want to encourage them to bring their friends and family, and promote your event to their network. You next need to broaden the circle to outside of your immediate network. This is the general community in your niche. If you’re running a classic car show you want to reach out to people with an interest in classic cars. If you’re hosting a geek culture conference, you want to reach out to people with an interest in geekdom. These will be people who may not necessarily be aware that your event exists, but would want to attend if they found out about it. The basic principle involved here is to start with your core network, then push out as broadly as possible. This is what you might call the “no stone left unturned” approach to event marketing. This is an approach that doesn’t just leave building attendance to luck, it’s a way to lock down the most engaged people first, then ask yourselves ‘“ok, we’ve got this cohort locked down, now who else can we get signed up?” This process will create momentum in your event promotion strategy and will help steadily build up a buzz that will get your supporters excited as they see the event build and build. This brings up an important point; it’s important to start building your event as early as possible. These things usually have an accumulation effect, as over time more and more people sign up and you establish a positive feedback loop of attendance. That said, not all events are the same size or caliber; if you’re promoting a 60-minute webinar, you won’t need as long a lead-in time (6-12 weeks) as if you were building an annual conference (6-12 months). Effective event promotion means being as granular as possible when it comes to both breaking down and reaching out to your existing network of contacts. We’ll distinguish these two types of people as Committed and Interested respectively. Use an outreach strategy that has a twin-track approach that can relate to both types of people, because each type of person has a very different mindset. For the Committed people, focus on how your event is an opportunity to take their love of your brand to a deeper level. For the Interested people, focus on the elements of your event that are as entertaining or exciting as possible… the elements that have the broadest appeal. 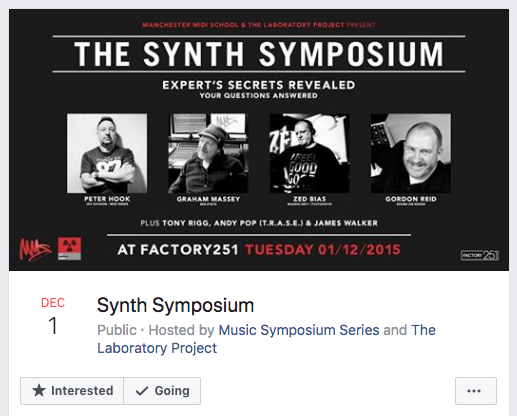 Let’s say you are organising a synthesiser symposium (it happens). To the Committed people, you can talk about how you’ll have the latest model synth that’s super rare and only very few retailers can get their hands on, etc. For the Interested people, focus on how a popular musician is going to be doing a demo of the latest synth tech. See how these are two very different approaches to promoting the same event? Of course both selling points are of interest to Committed and Interested people alike, but one’s a hard sell and one’s a soft sell (Soft Cell, get it??). I’ve listed them in ascending order of how committed they are to your brand. The more commitment they’ve shown to you in the past, the more likely they are to get more involved and attend one of your events. Make sure they’ve given permission for you to contact them in this way. Promoting an event is pretty intensive, so you want to avoid haranguing people straight out of the gate! Now you have a list of people to contact, and a means of contacting them, you’ll want to dedicate a day or two to contacting these people and getting them hyped for your event. Promoting discounted tickets for early buyers is a simple and classic way to kickstart your event promotion. At the early stages of your event it’s hard to create a sense of scarcity as it’s unlikely the event will sell out immediately. So this is a good way to create value for early booking. It’s worth taking a moment here to emphasise the importance of actually selling tickets rather than giving away free tickets. The fact of the matter is that once people have invested money in an event they are more likely to attend because they don’t want to have wasted their money. They’re also more likely to promote the event because they will feel committed and will want to share their experience with other like-minded people. Of course there will be exceptions to this rule but it’s worth thinking about. 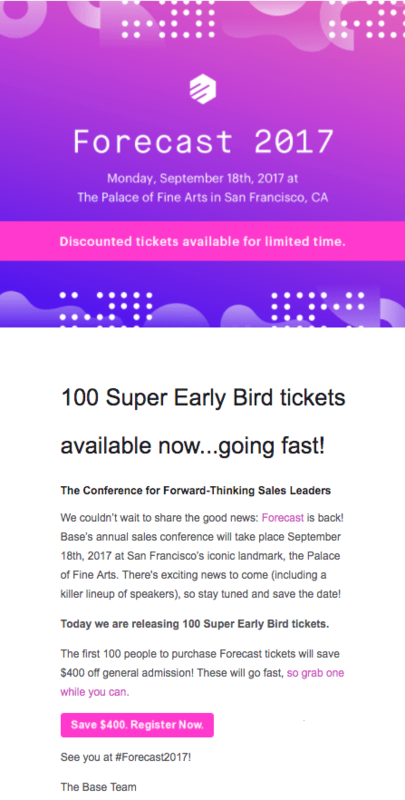 The ”going fast” line is a good one; as the early bird tickets get snapped up you should keep your network informed, explaining that they are selling rapidly and that the discount will end soon. This provides a sense of fear over a potential double disappointment; people might miss out on a discount and, worse still, they may miss out on the event altogether if it sells out! Plus, you want to be able to use the “going fast” line as much as possible in your event promotion, so here’s a great chance to do it early on. This is another time-tested event marketing strategy. You may not have all your speakers nailed down when you begin promoting your event, but you should make sure you have some big-hitters booked in to start with. Start with your broadest, most mainstream speakers to draw in a wide audience, and then announce more niche-interest speakers to add depth. Sometimes niche speakers are more of a draw because people have less opportunities to see them in public. It also means you’ll appeal to the Committed super fans we talked about earlier. 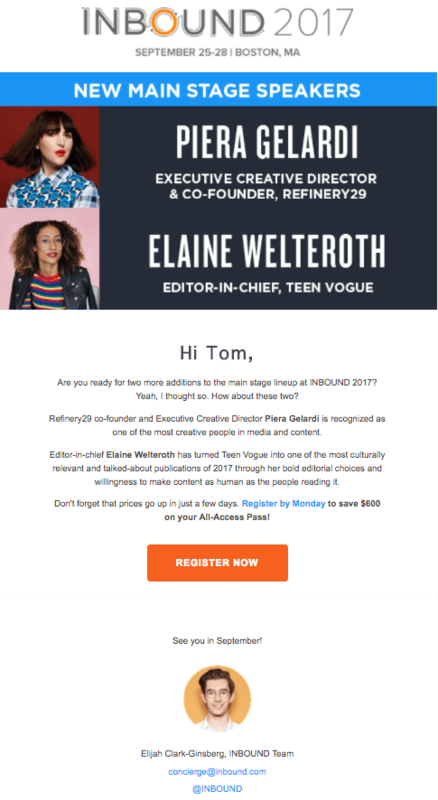 The above email effectively highlights a couple of prominent speakers. This is great, but you want to make sure you mix things up as much as possible. Highlight speakers in terms of their star-draw, but also promote them in terms the various ‘themes’ or ‘tracks’ of your event. If you’re organising a media conference, you’ll probably have a traditional media track where you’ll want to highlight some popular editor or trailblazing investigative reporter. You’ll probably also have a social media triack where you’ll want to promote the attendance of a star blogger or overnight Twitter sensation, etc. A speaker promo pack is a bunch of content created around individual speakers, promoting their presence at your event. If they’ve published a popular or recent book, you might have a meme with a short extract from it. If they’ve release a new music video, you can attach links to it in your promotional content, and so on. Try and encourage your speakers to circulate their own promo packs. They’re more likely to promote your event if they’re promoting themselves whilst doing it! Make it as easy as possible for your speakers to share their promo packs. This could mean tagging them in a social media post and asking them for a re-post, or sending them an attachment to add to their own newsletters. As well as seeing your event as a whole, think of it as a bunch of different mini-events all happening at once. This gives you much more leverage to convey the value the event offers attendees. Create promotional content for each aspect of your event. The trick is to find as many angles to your event promotion as possible. This won’t just increase the chances that people will find the different elements of your event appealing, it will also stop audience fatigue as you’re not endlessly banging on about the same thing all the time. The last thing you want is people to be sick of you by the time the doors open! You want a short and snappy hashtag to not only promote your event in the run-up, but that people can also use to tweet about it as it happens and review it after it ends. Hashtagging is a way to bring all your event related content together in one place and also gives you a structured way to hold an online conversation about it. All promotional material should feature your hashtag, even offline materials such as direct mail and posters. You want to make it as easy as possible for people to promote your event hashtag. Each social media platform has its own format, style conventions and social media etiquette. Don’t just paste your Twitter copy onto your Facebook page, make sure you compose your content to work best for each social media account you use. Each account’s promo campaign should begin with a ‘starting gun’ post; by this we mean a broad, generalised post promoting the fact that you’re hosting an event and outlining it in broad strokes. Include your biggest speakers and any standout topics, but you will be going into more detail with later posts. If possible, you’ll want to pin this post to the top of your account so it’s the first thing people see when they check out your profile. Your pinned post should always be about your event as it’s the most important thing you’re promoting. The great thing about Twitter is that it works on a “little and often” model of content publishing, so you can drip-feed content to people over an extended period of time. 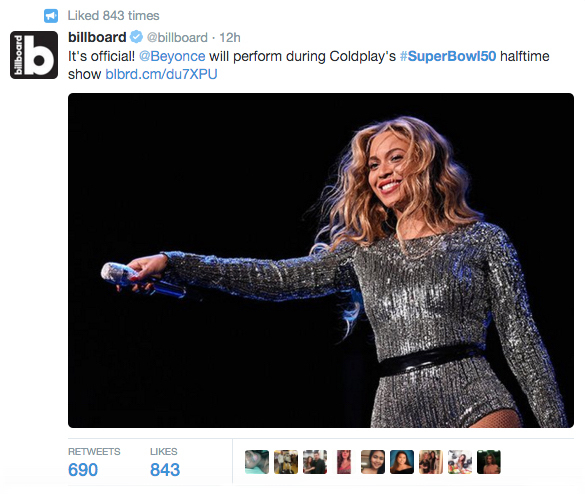 Create Tweets to promote the different elements of your event. Pin the most important or popular ones to the top. Follow the event conversation taking place on your hashtag. Retweet the ones that portray your event in the best light. Post photos and videos highlighting the event; they get more exposure and will make it look more appealing. 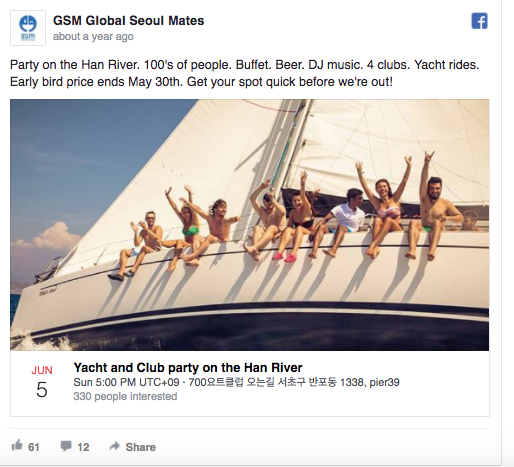 The cover photo and title are going to be the most seen parts of your event, so they need to look exciting and professional and effectively serve as standalone ads. Get to the point in terms of the value the event will bring. I mean, who wouldn’t want to attend this event? The image gives its audience an idea of what being at the event will be like. If you can get people to imagine what that will be like, they’re much more likely to be motivated to attend. Note that the photo is visually interesting, not just people in a club. It creates a sense of FOMO – fear of missing out! The title should state clearly what type of event it is and contain its location. If it’s a regular event, that might be worth mentioning. 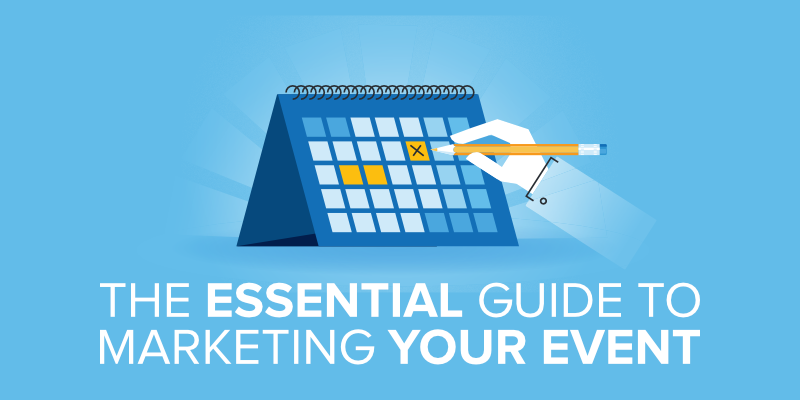 After you’ve set up your event, make sure you get someone to look it over and make sure that it is as clearly written and designed as possible, and that all necessary event info is included. 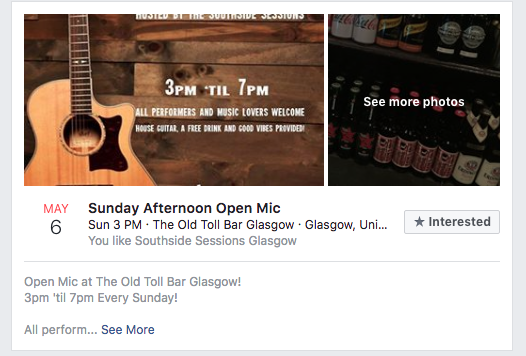 Given that an event is a big investment for you, it is recommended that you pay for Facebook ads to promote it. 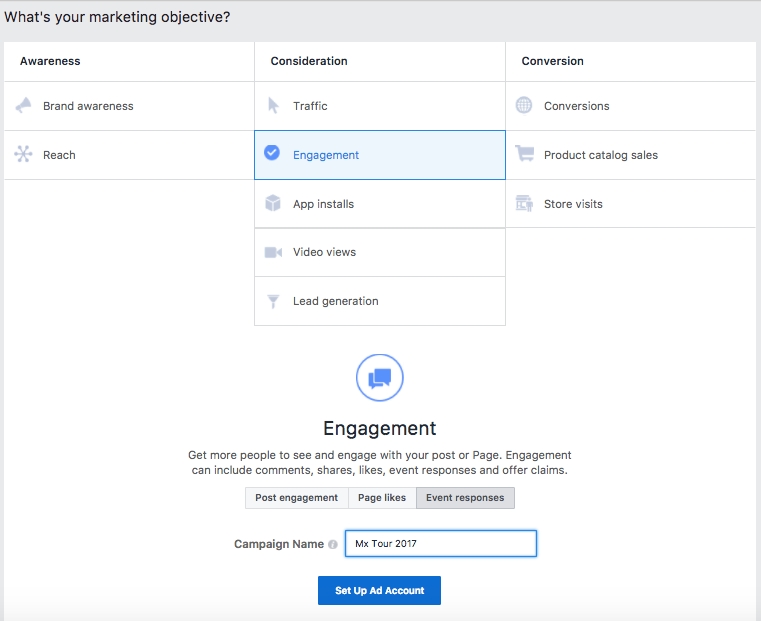 You can configure ads to generate a desired “event response” under the “engagements” tab. This will promote your ad to people who have already responded to it in some way. This plays on the fact that people need to see an ad several times before they respond to it. Eventbrite is a great way to automate a lot of the drudgery of event organisation. Given that GDPR will make it harder for event lists to be used as general marketing lists, you want to move away from using spreadsheets to manage your subscribers. All personal data needs to be held in a securely encrypted way. Best to leave that to professional services like Eventbrite. Of course, if you’re in the event organising business you already know all about Eventbrite. So let’s take a look at some of the things that are often neglected in the rush to build and promote an event as quickly as possible. Eventbrite tell us that 89% of attendees discover an event via search. For example, the word “conference” is searched 10,000 times per month. 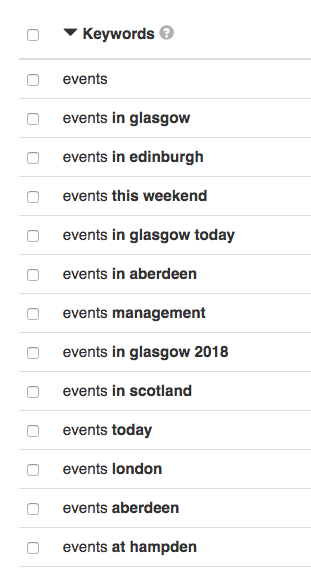 Other popular keywords include “events near me”, “events in [area]”, “events this weekend”, and “events in [area] today”. If people are making general searches like these it means they are probably looking for leisure or entertainment events of general interest, but they might also be looking to quench their intellectual thirst, so lectures on arts or science may also go down well, for example. Of course you should do your research and use tags that are as specific to your event as possible, but this is doubly true if you are marketing an event to a niche interest group or audience of professionals. B2B event search times are more likely to be something like “dentistry conference”, or “tech roadshow” than “events near me”. SEO planning is not about the search for a magic bullet keyword that will supercharge your event attendance, it’s more about thinking about how people go about searching for events in the first place. You should start from the premise that a relatively big audience already exists who will be interested in your event (rather than trying to magically generate interest out of thin air) and ask yourself, “how are these people trying to find my event?”. Of course, they may not be looking for your particular brand, but you want to make your event match their interests as closely as possible and look like the best option out there when they do come across you. If you’ve already marketed events in the past you’ll have lots of data to draw on to make your next event even better. You’re probably using Google Analytics already (if you’re not you definitely should be), if so you should take the time to research the search terms people used to find your past events. You can also use your event app to link people to directions to your events, sell tickets, and use their smartphone to share content via social media. Downloading an app is also a sign that people are committed to your brand and might attend future events. This creates a helpful way to segment your contacts and build up a detailed list of your core network as described at the top of this article. AppInstitute make it as easy as possible for you to build an event app quickly and simply, without needing any coding knowhow. You can build your app yourself, or hire us to develop it for you. Find out more on our event app page and get started within minutes. To find out more about getting an affordable and dynamic app for your event brand, get in touch with us today.